You are a child. You are bedazzled by brightly painted high-stepping horses with long flowing manes, jeweled bridles, and colorful saddles. The horses prance up and down, round and round, to joyful music that makes you yearn, pine, and long to spring onto the platform and ride forever on the cheerfully circling carousel. It is a dream … a fairytale … a beckoning finger that invites you to leap, jump, and gallop off into a fantasyland of delight. But… but the carousel is behind a closed gate. A stern-faced guard demands a ticket before he will let you in. The ticket cost five cents. You are poor. You do not have five cents. YOU CANNOT RIDE THE CAROUSEL. So begins this story, more fanciful than a Disney movie and more deeply entrenched in the mythology (and reality) of American industry than the histories of John D. Rockefeller or Henry Ford. George F. Johnson is the hero of our tale. He grew up to create the Endicott-Johnson shoe company, which at its peak employed over 24,000 people. From 1919 to 1934, George F. Johnson built six carousels. This translates to 300 brightly painted wooden horses (with a few saddled pigs and dogs thrown in for good measure), several chariots (the ugly monkey is unforgettable), beveled mirrors, Wurlitzer organs, musical bells, and brass poles. Which means that single-handedly, our hero put more smiles on more faces than the combined efforts of all the roller coasters, cotton candy, and Ferris wheels in the world. Including the smile on my very own happy face. And I’m no kid. Speaking of The Twilight Zone, a painted panel on the carousel in the city’s Recreation Park proudly depicts the creator of that remarkable TV series as he introduces the episode fictionalizing his childhood experiences in Binghamton on that very same carousel! Well, I thought. If Rod Serling could write about carousels -– and he is one of my heroes -– then I can write about them, too! 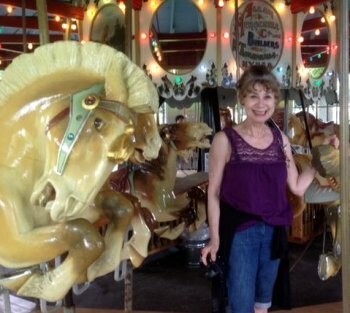 And so, inspired by many things, including Anne Serling’s loving memoir “As I Knew Him: My Dad, Rod Serling”, I asked my friend Doreen if she wanted to join me on a Great Carousel Adventure. She did! In just a few hours, we rode all six carousels in all six parks. After finishing our final dizzying ride (by then I could barely walk a straight line), we were presented with big round buttons displaying galloping horses, blue and red jewels, and the words: I Rode The Carousel Circuit. It was so much fun!!! Over ninety years after George F. Johnson first began to implement his dream, his lights are still blazing, his organs are still playing, his horses are still prancing, and his truly enchanting carousels are all still free! He created them to give people pleasure: Two in Binghamton; two in Endicott; one in Johnson City; and one in Endwell. Maybe not a hop, a skip, or a gallop away for everybody, but worth the trip no matter where you live. Have you already been to the Grand Canyon? Seen the Redwood Forest? Been to Chicago, New Orleans, Orlando and San Francisco? Are you cudgeling your brains to decide where to take Mom and Dad, Grandma and Grandpa, your cranky children, or your teenagers (who think that they’ve seen and done everything) on your next adventure? Well, think no more. Unplug your computers, leave your cell phones at home, disconnect your headsets, and head for the tri-city area of Greater Binghamton New York. Visit one carousel and ride it a dozen times. Or ride all six carousels in one day. Then come back the next day and do it again! We work hard. We take care of our families. We try to be good people. But it’s summer! Time to swing on a hammock, fall off a bicycle, lie on the grass, eat ice cream, stare at the clouds, and reward ourselves for lives well lived. And in this big, beautiful, complicated world, what could be a better reward than a ride up and down. Round and round. With joy in our hearts, a smile on ours lips, and the wind in our hair. There is no breeze anywhere like the breeze on a carousel.